After spending a few days in Loire Valley, we hopped in our rental car and drove to Annecy, France! About a 5-6 hour drive, it didn't feel too long, simply because the scenery was so beautiful. Before our trip, I'd heard of Annecy because several travel bloggers I follow shared their trips to this breathtaking spot. 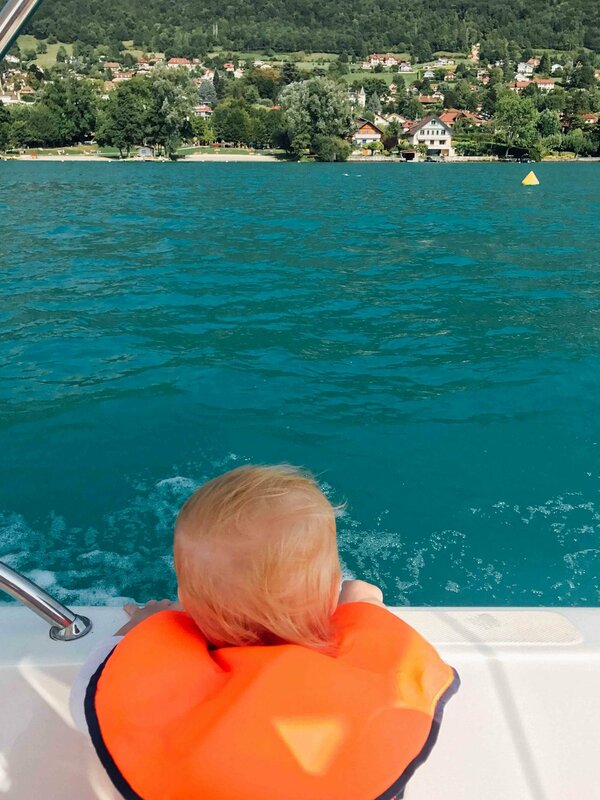 But when Daniel's twin and his family visited Annecy and adored it, a few months before our trip, they so highly recommending it to us and we knew we needed to see it! It did not disappoint. We arrived at our hotel in the later evening (we stayed here -- it was cheap and it was a tiny little room -- but, it was safe and clean.) It's always exciting to arrive somewhere in the dark and wake up to the sunlight in a brand new, fresh spot, ready to explore! I gasped. 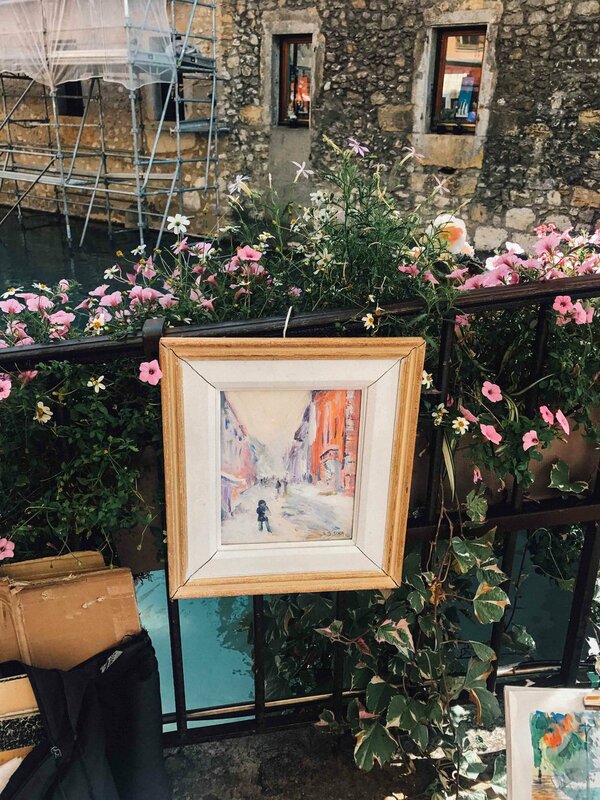 It was purely, truly breathtaking: the cobblestone streets full of tables, full of bread and cheese, every colorful vegetable and every bright fruit. Early morning and few people mulled about, the morning sun hitting the turquoise water of the canals and shiny cobblestone streets. As we wandered through the market looking for coffee, we came upon a water fountain full of colorful rubber duckies! Weston lit up. There were even little fishing rods for kids to play and "fish" for the ducks! Happily, it was situated right beside an espresso cart cart! As Mama and Dada sipped coffee, baby bear played to his heart's content with the ducks in the fountain. 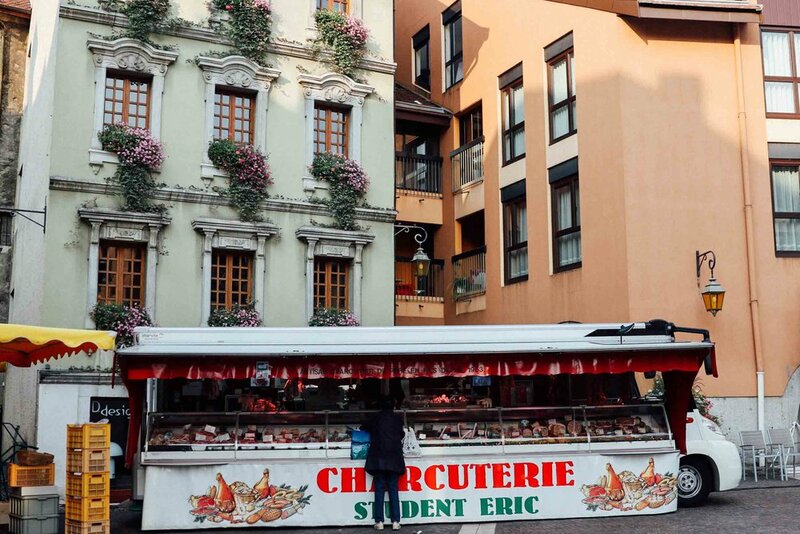 That morning in Annecy still stands as one of the happiest I have seen my boy! Stumbled upon the loveliest street artist, which we highly appreciated, Daniel being a busking musician, himself . These paintings spoke to me! Pictures don't do Annecy justice. The beautiful buildings, each tall and unique. The dreamy shutters. The flower boxes. The swans. The sidewalk cafes. The rosé. The fondue. Mmmmm! Look at this darling park! Our brother and sister in law helped us out by telling us all about this spot and a few other great ones to see and visit, thanks guys! This park was so perfect! Weston enjoyed running around and playing with the sweetest French children. 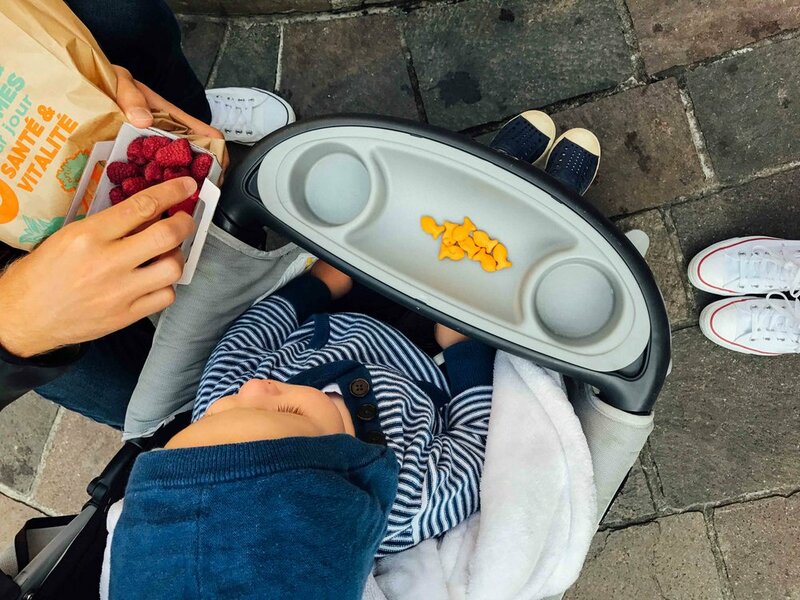 Tip while traveling with littles: find a park or some open place for them to run free and play, each and every day! They'll be so much happier. Shop after shop after shop -- full of charming, delicious, pretty, good things. A wall painting I noticed. This water!!!!! We could've stayed out here all day, mostly watching my boys' happy, glowing faces.